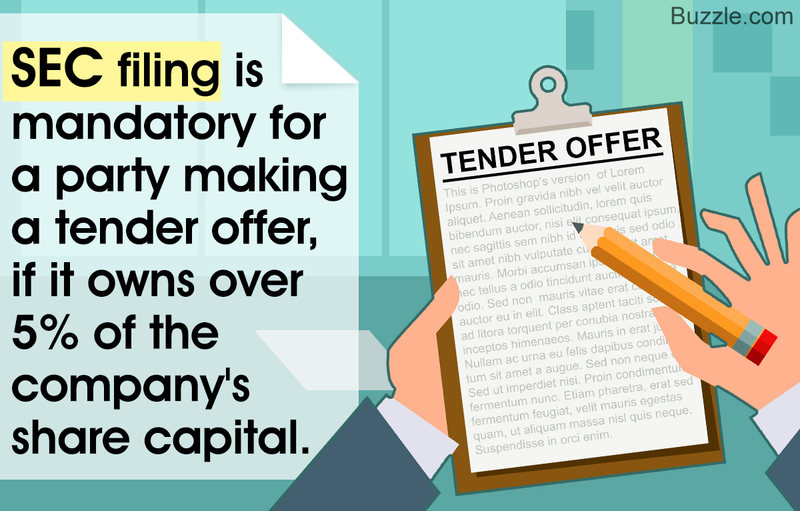 A tender offer is a proposal made to the current stockholders of a company, to sell their stocks, either by the management or by any other party. The primary reasons are to reduce the share capital of the company or to acquire a percentage of the company's ownership. This WealthHow post gives you the meaning of a tender offer with examples. On 9th October 2014, the high-profile investor Carl. C. Icahn had written an open letter to Tim Cook, CEO of Apple, Inc. urging him for a tender offer, since, according to him, the company, despite having done a wonderful job in the market, remained undervalued in the stock market. He maintained that the company had a bright future considering its recent growth in sales, with an assurance of not tendering any of his shares, in case the company obliges with his request. The market gurus are busy anticipating and analyzing the viability of Carl's suggestion and everyone's eyes are set on Apple's moves. A tender offer is an offer to buy the stocks of a company, usually, at a premium price. Such an offer can be made with the intention of taking over a company. It is a way of solicitation to buy the stocks of the company, and can be done by the company's management or a third party. Such an offer is open for a limited span of time, and has to adhere to the statutory requirements of the governing laws of that nation. To convince and induce the buyers to sell the stocks, they are usually sold at a premium. However, it must be noted that a tender offer does not always imply full ownership of the company. There might be some dissuading stockholders who do not sell, and the third party may obtain a limited number of stocks only. Tender offers can be considered as one of the ways to initiate a merger. There can be a myriad reasons why the company chooses to buy back its own shares. Firstly, it may do so to raise money by reducing its own capital. Instead of investing in the market, it may consider it viable to invest in itself. Secondly, the management might be of the opinion that there is too much circulation of its stocks in the market, and for the restructuring of accounts, it is necessary to buy them back. Such a buy-back can also be made if the management is anticipating the threat of a hostile takeover. A tender offer can also be made by any other party. The party has to comply with the requisite disclosure requirements. However, such an offer, if acceptable to the management, can be a case of friendly takeover. A thorough knowledge of corporate and securities law is required in this case. A tender offer can lead to a merger. If the party obtains more than 90% of the stocks, the potential acquirer can adopt short-form merger, and acquire the interests of dissuading stockholders. In case the potential acquirer owns less than 90 % but more than 50% of the shares, the merger will require a unanimous shareholder approval. In case of a hostile takeover, the management usually rejects the tender offer, but the acquirer can convince the shareholders to sell the stocks. If a majority of them sell, the acquirer may overthrow the management of the company, and look after the affairs of the company as per its rules and regulations. A mini-tender is a proposal to the bidders that does not exceed more than 5 % of the total share capital of the company. The statutory requirements in case of a mini-tender are much lesser as compared to a normal tender offer. Hence, the investors have to be cautious while responding to such offers, as to whether they will get a fair return for their investments. It is advisable to make a market survey before tendering the stocks. For example, the company 'Target Corporation', that is listed in the NYSE stock exchange market, had received a mini-tender offer from TRC Capital Corporation, on November 4, 2014. However, 'Target Corporation' had urged its stockholders to not tender their stocks to the company, and if already made, to withdraw it before the expiration of the offer. The company cited the reason that the bid price offered was much lesser than the market worth of their stocks. ❏ As per the laws of the SEC (U.S. Securities and Exchange Commission), the party making a tender offer is required to file a disclosure statement on Schedule TO, in case the party is owning more than 5 % of the share capital of the company. ❏ The party is also required to do other filings as per the requisites of the SEC. In response to the acquirer, the target company is also required to make its own filing. ❏ In the United States, tender offers are governed by the Williams Act, which was passed in 1968. It was passed after there were frauds relating to tender offers. Respective nations have their own legislative and statutes governing such offers. ❏ Other than that, the company and the bidder has to comply with the statutory requirements of their respective states. Note : Kindly note that the above procedure is not exhaustive in nature. It is best to consult your legal attorney. Whatever the case may be, the stockholders have to be careful and make a wise decision before selling off their stocks. Other than that, the management has to be vigilant and ensure that tender offers that might result into hostile takeovers are tracked and avoided. Obviously, it can work as a reverse strategy from letting the stocks fall into the hands of the predator. Note : The above article is for reference purposes only. For the legal and statutory requirements, one should seek advice from an expert.